Solspace has been helping ProPublica with rapid growth and change since launching their website in 2008. ProPublica is an internet based, non-profit source of investigative journalism. Solspace has an ongoing role in the evolution of ProPublica’s site: building out new content sections under tight deadlines, creating frameworks for the presentation of ongoing stories, expanding the site’s reach to mobile devices, and integrating site functions with a variety of external systems via API including ChartBeat, Factiva and DocumentCloud. An example of our extensive customization work for ProPublica can be seen in their curation tool. When developing smaller ExpressionEngine sites, we are able to use statuses for curating things like featured stories. ProPublica outgrew this method as it developed a mobile site and mobile apps that needed curation independent of the web site. 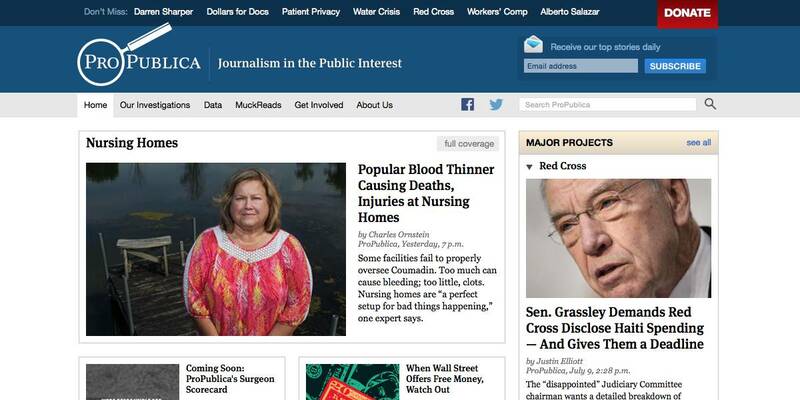 ProPublica also wanted finer control over the featured stories on its homepage. The curation tool interface displays a list of the most recent posts to many content sections. Directly from this tool, content editors are able to see which stories are currently featured for both mobile and the site’s homepage and modify the selections. There are three featured positions that editors can curate. All stories are by default published to mobile, but editors can exclude stories when needed. The tool also communicates to editors if a story has data fields populated that are required for featuring a story. One of three variable homepage layouts can be selected. Content for the three featured positions is auto-filled in form fields so that editors have the option to override the default content to deliver a customized homepage headline or summary. ProPublica uses a server-side caching tool called Varnish that is incredibly useful for protecting against performance problems due to traffic spikes. Solspace collaborates with the ProPublica team to create tools that selectively invalidate cached pages for articles and all of their related index and topic pages when an article is added or edited. This insures that while Varnish is delivering lightning fast pageviews, users are seeing the most current versions of all pages. In the summer of 2010, Solspace worked under a tight deadline to launch a redesign of ProPublica.org. The project involved close cooperation between Mule Design and ProPublica’s internal team of developers. Mule provided HTML/CSS and ProPublica provided JS, and these were still in flux when a tight deadline demanded that ExpressionEngine integration begin. Code changes were tracked in SVN and translated to the build as they happened. All involved rose to the challenge and the redesign launch met it’s deadline. In redeveloping the site, Solspace re-engineered significant parts of the site’s data structure to conform with the redesign. We took the opportunity to make template and data improvements that would streamline future growth. Our relationship with ProPublica demonstrates Solspace’s high level of technical dexterity with ExpressionEngine. We also bring a strong work ethic, enthusiasm, and a sense of responsibility to our work. In the past year, ProPublica has won a Pulitzer Prize for Investigative Journalism as well as numerous other awards. They have produced groundbreaking investigations and are telling stories that have the potential to create positive change. We are proud to play a part in ProPublica’s important work.